As a puppy Nikita was sold to Holland and her petname was at that time Kulta. 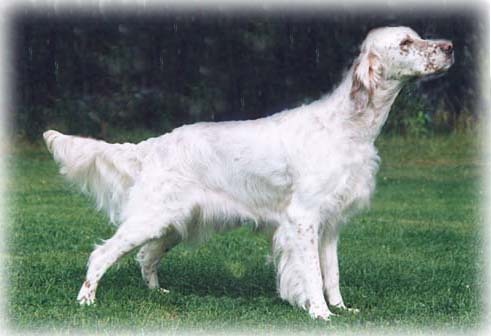 In March 2000 she returned to the breeder. I admired this beautiful girl very much at some shows during summer and was joking about wanting her. In December Jaana called me and asked if I was serious. And of course I was! I was very happy to welcome Kulta/Nikita to my home. In January we went to our first show together and was lucky to get a CC! At our next show Nikita got her first CACIB and BOB. And this was a start of a wonderful year with several Groupwins and -placings! 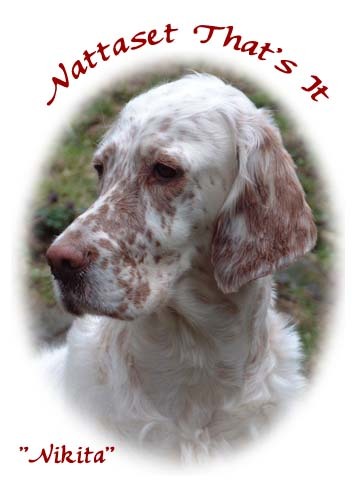 In 2001 Nikita was Top-winning English setter at shows in both Finland and Sweden. She was also Top-winning in Sweden 2002. After this we slowed down with showing and last year we didn't show at all. Maybe we will come out with Nikita as a veteran again. But for now Nikita is enjoying her life without showing. She's happy sitting in her garden looking at birds and squirrels. And of course the best of all, running in the woods! Thanks Jaana for this wonderful little girl, who with her sheer presence can brighten up the darkest day!